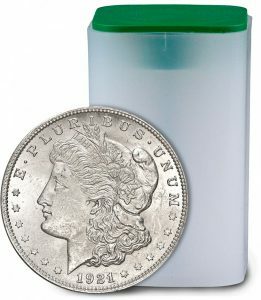 1921 Morgan Dollar – Own A Piece Of American History! This is also the last year the U.S. minted the famous Morgan silver dollars which is often considered the #1 silver investment coin. Blanchard is pleased to offer ten (10) 1921 Morgan Dollars for only $22 each. As you can see in the video below, the last time Blanchard offered this special, Morgan Dollars were priced at $26 each. Take advantage of this limited time offer and buy now! The Morgan Dollar obverse features Lady Liberty wearing a headband labeled LIBERTY. Her curls fall loosely from a twist at the nape of her neck. She is surrounded by 13 stars representing the original colonies. The year of issue appears at the bottom. The reverse of each Morgan Dollar features an American Eagle with the words UNITED STATES OF AMERICA at the top. It is also engraved with the motto IN GOD WE TRUST and the coin’s denomination.